There are two types of alarms, �standard� which are available all the time, and �Advanced Alarms� which are only available if the �Advanced features� option is enabled. Up to 5 alarms can be configured on the DASH2 PRO, for each of the alarms, select the channel to be used, then select greater than or less than, and finally set the value which is to be used for the alarm. When the alarm is triggered the screen of the DASH2 PRO will change to show the channel which has triggered the alarm and the value. When an alarm is shown on the screen it can be cleared by pressing any button. After pressing a button the DASH2 PRO will wait for 30 seconds before monitoring that alarm again. This option can be used to stop an alarm condition re-occuring many times and having to be cleared every time. For example if there is a water temperature alarm the driver might well know all about the condition but not want to be reminded of it on every lap, so it can be set to stop being displayed after a set number of times. USE WITH CAUTION! When set the alarm can be cleared by pressing a button, otherwise the user needs to wait for the timeout to occur. If the �low side driver� option is enabled on the DASH2 PRO and the input pins 1-4 are not being used for any other function (analogue input, unit control input, output driver) then they can be used by the alarm to trigger an external warning. 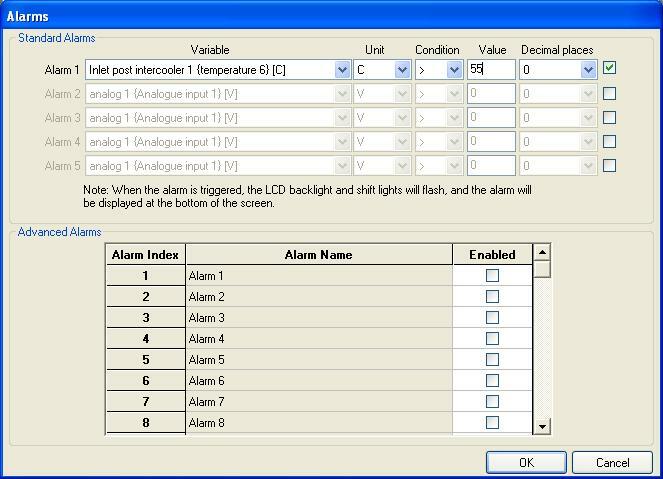 When set the alarm information will be stored in the internal alarm register. This can be very useful for showing which alarms were present during driving, ideal for use in vehicles which are rented out to paying customers! Alarm conditions can be copied from one alarm to another by selecting the required source alarm and clicking �Copy all options from alarm� at the bottom of the screen.